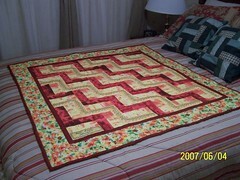 Split Rail Fence Quilt is a Finished Object!! Posted on June 4, 2007	by Linda S.
This entry was posted in Crafts, Embroidery, Handcraft, Handwork, Needlework, Personal, Quilt, Sewing. Bookmark the permalink. 2 Responses to Split Rail Fence Quilt is a Finished Object! !